Adventures in Everything: Adventures in the Midwest! Last summer, Aaron and I are went to on a wonderful trip to the midwest. I orginally wrote the blog post back in July (on my super-cool tablet, of course!) but failed to post it because I had yet to upload the pictures. Here were are chillin' in December, and I am just now posting... better late than never. Anyway -- here the story of our midwestern adventure! The first leg of our adventure was to Chicago, Illinois. We met Aaron's family for an action packed adventure through the city. We started our visit with a visit to Chicago's Museum of Science and Industry. They featured a visiting tour of Body Worlds. While admittingly a little creepy, the plastiscine exhibits were very interesting and informative. It was really awesome to see how complex and interconnected the human body is. It was also neat to see a few animals as well-- a ginormous giraffe, a small baby lamb and a very large ostrich. Following the exhibit we grabbed some lunch and had just a few minutes to explore the rest of the museum. Clearly we were not able to see all of the cool exhibits, but we were able to witness the Tesla coil in action! We also got to see some sights as we drove around the city and around Lake Michigan. The lake was very beautiful. We were able to see the Willis Building and the Navy Pier. Our next top was to see the long-showing Chicago performance of the Blue Man Group. It was not at all what I expected. Whereas I thought I was getting a shown like "Stomp! ", we actually got a show that was a blend of comedy, music and performance art. It was very entertaining. But I must admit that the bathroom song playing in the bathroom might have been my favorite. We concluded our evening with the ONE thing I had to do while in Chicago....enjoy a fat slice of deep dish pizza. The family headed over to Giordano's where we noshed on a delicious cheese and mushroom pie. It was heavenly! And the perfect conclusion to our first day in the Windy City. Our second day of adventure in Chicago led us to the Adler Planetarium. The Adler featured a brand new viewing room which just so happened to have been powered by NVIDIA graphics. We then enjoyed the offerings of the museum, none we enjoyed more than the "Astronomer Talk" led by one of the resident space-nerds. It was wonderful to see him light up when discussing black holes, dark matter and recent astronomical discoveries. We grabbed some lunch and headed off to the local theater to see the final installment of Harry Potter. Following the movie, we had some superb Indian Cuisine in a neighborhood of Indian Restaurants. During our week long stay I was able to check a few more things off the "Things to do in Iowa" list. We went to see a summer rep production of the broadway musical "I Do! I Do!" We visited with many old (and new to me!) Iowa friends. Aaron and I walked around downtown Iowa City. We drank for several hours in an Iowa City bar. We ate at the Hamburg Inn, at the Ronald Reagan Presidential Table. I got to see a Sam's Club in Cedar Rapids! We ate ice cream at the infamously delicious Whitey's. We had a brief tour of the Natural History Museum at the University of Iowa! The trip was highlighted by explosively fabulous thunderstorms and the beautiful glow of lightening bugs. Best of all, Aaron got to be the bestman at his friend Brandon's wedding. 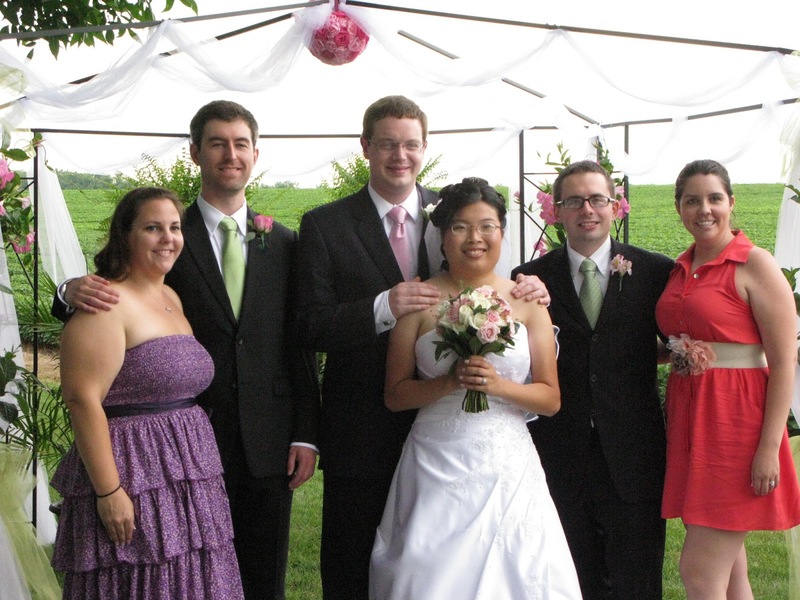 Brandon Moore and Lisa Fukui were married on Saturday, July 23 at the home of the Moore family. It was absolutely lovely! While the sky did drizzle a bit, the rain stopped at just the right times, and the clouds made for a wonderful soft light that only helped make the whole thing more beautiful.